The NHS is the world’s 5th largest employer, coming in behind McDonalds. Since 2003 each of its 1.7 million employees will have come across NHS Jobs at some point in their application process. So, no biggie for one of our first DH Digital service design projects! A jobs board and end-to-end application tracking service for the NHS, the service now publishes 300,000 jobs each year, handles 4.5 million applications and is used by all 154 NHS trusts and other NHS funded health care providers. The NHS Jobs contract is managed by a small team in DH. This contract is drawing to a close, and DH Digital are helping the team take the service in a new direction using a service design approach. Although innovative when it was first released, NHS Jobs has become slow and expensive to change, and it doesn’t meet the government’s service standard. Working very closely with the DH team - Sharon, Ben and Cris - myself, our delivery manager Hong (and erstwhile product manager Chris) are now completing a discovery with the help of our delivery partner dxw. About a year ago, the DH team started to investigate the NHS Jobs service. We hired 2 specialists (a user researcher and a product manager) to boost in-house skills. Although this period of ‘pre-discovery’ generated useful insights and analysis, we found it difficult to get them to work as a team. They ended up working independently and the project didn’t have a sense of momentum and passion. To address this we bought a discovery as an ‘outcome’ from the digital marketplace. We got the benefit of a team already used to working together, and were better able to transfer skills and build capability in the DH team. Before contracting our supplier, the DH team collected a large amount of desk research and developed useful things, such as a user journey map for applicants and recruiters. We kicked off this final discovery phase with an inception day - facilitated by dxw - where we gathered to build a roadmap of what we needed to learn or prove. This session helped us get to know each other and see what we could all bring to the project. The DH team (plus Sarah from our managing agent Cwm Taf) have tons of knowledge about users, the technology legacy and the political and business context. They have a lot of contacts and relationships with users and stakeholders to draw on. We in DH Digital have plenty of experience in designing, building and running transactional services that meet user needs. dxw inspired us with their early vision for how technology, better design, use of open standards and structured data could transform NHS Jobs and help make recruitment in the NHS a joy. Involving assurance and procurement colleagues from the start. Having these colleagues in early discussions is so helpful for context sharing - particularly as we ended up requesting 2 chunks of money to complete our discovery. Engaging Cabinet Office and GDS early to mitigate approval blockers. As well as completing our discovery in 2 stages, we needed to agree a contract extension for the current service. Involving the Government Digital Service (GDS) outside the formal approval route helped us clarify our approach. Working out what works for us. Although beloved by digital teams, Slack and Trello weren’t always the best way to collaborate with our organisation's IT kit, different work patterns and multi-location set-up. My first NHS Jobs Trello board was a lonely place with just me shuffling cards and commenting to myself. We still use Trello to varying degrees and our Slack channel is mostly DH Digital and our supplier - and that’s fine. Because we all gather for a 30min weekly ‘standup’ via Bluejeans, facilitated by our delivery manager Hong, and walk the Trello board then via screenshare. It’s become a genuinely enjoyable weekly ritual. Being open with our supplier. We’re working closely with dxw and sharing as much as we can. Building this trust is important, as is the evident enthusiasm and commitment our supplier has for service design thinking and improving the service. Getting closer to our users. 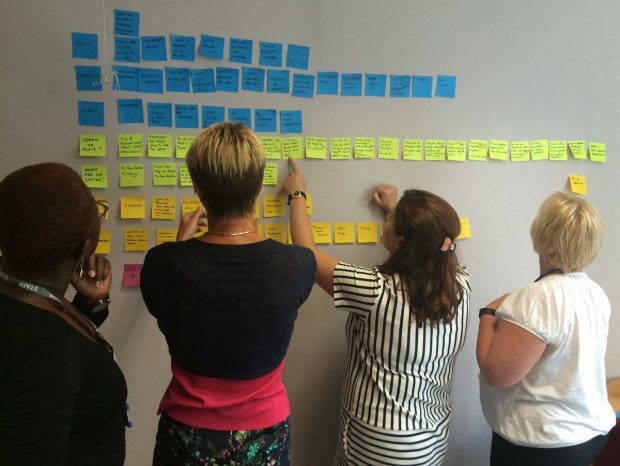 A long supplier chain means that the DH team get little direct evidence of how users interact with NHS Jobs, the context of their working lives and when and how they’re coming across the service. As part of discovery, the DH team are working with the dxw user researcher. We're all participating in observational, cultural research, helping to analyse data, identifying and validating users needs, and participating in co-design and sketching sessions. We’re now in the middle of our discovery. We’ll be updating further on what we’ve learned and how we plan to tackle the next stage - working out which problems we’ll test solutions for in alpha. If you’ve been an applicant or a recruiter on NHS Jobs and are happy to share your experience with our user researcher, please do get in touch.